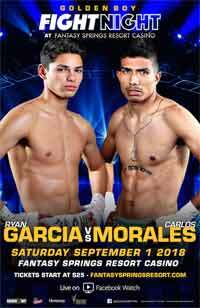 Review by AllTheBestFights.com: 2018-09-01, fight not so exciting between Ryan Garcia and Carlos Morales: it gets two stars. The undefeated 20-year-old Ryan Garcia entered this fight with a perfect record of 15-0-0 (13 KOs=87%) and he is ranked as the No.26 super featherweight in the world. He has already fought twice in 2018 winning over Fernando Vargas and Jayson Velez (Ryan Garcia vs Jayson Velez). His opponent, Carlos Morales, has an official boxing record of 17-2-3 (6 knockouts) and he entered as the No.61 in the same weight class. He fought three times last year beating Cesar Alan Valenzuela and Dardan Zenunaj but between these two bouts he lost to Alberto Machado (Alberto Machado vs Carlos Morales). Garcia vs Morales is the main event of the evening. Watch the video and rate this fight!